Sears offers a wide assortment of traditional and contemporary window designs with many options, as well as a variety of frame colors and grid patterns. Our Weatherbeater® Windows provide superior custom-fit features to suit your climate and meet your budget. 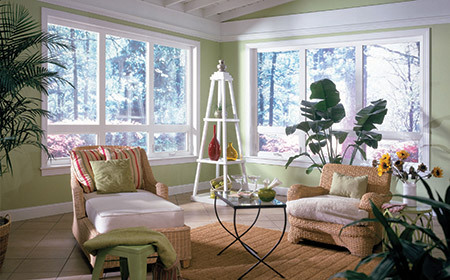 And, we offer every style imaginable from Bay and Bow windows to Double-Hung and Tilt-In designs. When considering new windows, consider the safety features you want, what energy savings you can obtain, and if there are other considerations for noise reduction or resale value. Because any home improvement project is a big decision, please take the time to be informed before making your choice. Request a free in-home design consultation and see how new windows from Sears can beautify your home. Request a FREE in-home design consultation and see how a new windows from Sears will beautify your home! Save $325 on windows purchase of $1,500 or more. Offer expires 5/4/2019. Not valid on prior sales or in combination with any other offer. Purchase requirement before taxes and after other discounts and must be made in a single transaction.